a mixture of pieces by various 19th-century guitar composers, including Giuliani and Horetski, as well as arrangements of Scots tunes popular at the time. 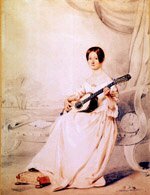 I studied classical guitar at the Royal Scottish Academy of Music and Drama in Glasgow, and have recorded a CD of many of the pieces from the Georgina Gregory manuscript on an original guitar from the period. I am happy to teach complete beginners as well as advanced students.